Great workout last night at Untamed Strength. I was able to meet up with Andy and get some good work in. Bench went well and the shoulder felt good. On my third set of 270 I only got 1 rep...I was benching on a comp bench outside of a power rack without a spotter so I didn't want to push too hard and miss getting stuck on rep 2. For the final set I lowered weight to 265 and easily got my 2 reps.
Did some pin presses with Andy for my second round of bench and those went well. All in all, I'm happy with the state of my shoulders. It was awesome to get a workout in with Andy. 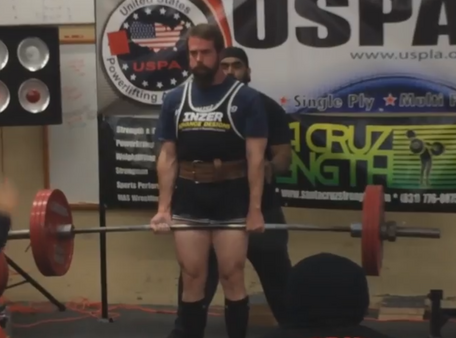 It's more impressive watching his deads in person than it is on his videos (which is pretty damn impressive too). His set of 512 seemed to fly off the floor. I'll be heading back to Untamed on Thursday for a heavier squats and lighter bench session.